This 58' Roscioli Donzi Express all weather bridge is the most elaborate and customized 58' sport fish yacht ever constructed. If you are one of the elite who only wants to own the very best, this piece of art is the acquisition for you. 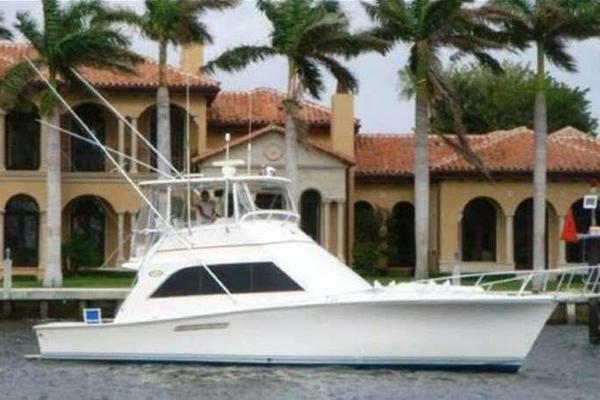 United Yacht Sales New Jersey would love to guide you through a personal showing of this 58' Donzi Sportfish 2003. This yacht for sale is located in Fort Lauderdale, Florida and priced at $1,595,000. For a showing please contact us by filling out the form on this page and we will get back to you shortly! Saloon/LoungeAn unusual feature to this sportfish is the custom built, removeable Eisenglass/Canvas door and bulkhead. When removed this leaves the salon completely open to the cockpit. Forward is a Ushaped Connoly leather sofa and ottoman with matching settee to port. Flat screen television is behind the settee on a lift for hideaway storage. Wet bar is to port and aft. GalleyForward and down from the pilothouse is the galley. The large Ushaped counterspace is oversized in neutral brown and beige granite with center island to match. A very wellplanned layout has everything at your fingertips with a Caldera halogen cook top to starboard and all other appliances well hidden in cabinets or behind matching teak doors. Keeps a streamlined and tidy galley. The beautiful raised panel cabinetry is varnished to a high shine. Master StateroomLocated all the way forward, this stateroom sleeps two in a queen size bed with mirrored bulkhead and light sconces. Bed lifts to reveal storage beneath and hanging locker and drawer provide additional storage. Flat screen TV with receiver and sound system for your entertainment. Ensuite bath includes Head Hunter toilet, marble shower, beveled mirrors, marble countertop and porcelain undermount sink. Guest StateroomLocated to port this stateroom sleeps two in upper and lower berths. The lower berth was widened for comfort. Hanging locker and low custom cabinetry for storage. AM/FM radio, CD Audio system and two flat screen televisions, one for each berth. The spacious cockpit has built-in leather settee, facing aft, high gloss teak cabinetry and removable cover. Well planned storage for tackle and gear for fishing makes for plenty of room. A custom high gloss teak table with four matching teak chairs can replace the two Sailfish and Blue Water Marlin chairs for cruising and/or alfresco dining. 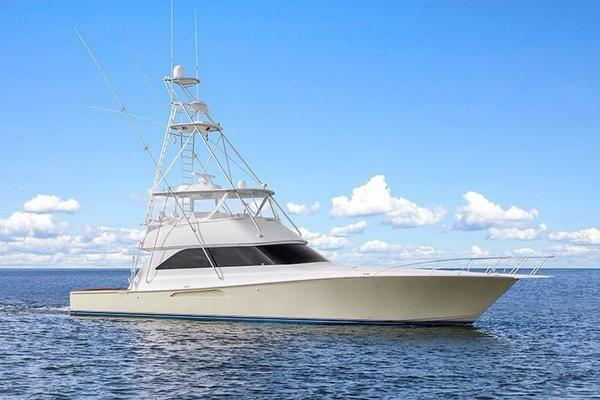 LITTLE PIPE is one of the most customized 58’ sportfish constructed by Roscioli International. With meticulous attention to detail, LITTLE PIPE is a graceful work of art; one of a kind sportfish. A true classic with all the modern touches.